When you hear the word pickle, what comes to mind? A salty brined cucumber, slices of mango preserved in oil, or maybe a bowl of pungent kimchi? Pickling is a tradition found in virtually every culture on Earth. Mango pickles from India taste nothing like German sauerkraut, but the underlying process is the same. Fermenting — This involves adding salt and allowing the food to sit for a period of time, while beneficial bacteria transform natural sugars into lactic acid. Vinegar Pickling — In this process, the acid comes from vinegar. Food is packed in a vinegar-based brine and allowed to sit for anywhere from a few hours to several months to achieve full flavor. I learned vinegar pickling from my grandmas and my mom as a kid growing up in Kansas. Even though I’ve become increasingly enchanted with fermentation, I still turn to the vinegar method when I want to make several jars of the same thing and store them without refrigeration, whether for holiday gifts or just for stocking for my own pickle pantry. Vinegar pickling usually gives more consistent results, since it quickly “shocks” the fruit or veggies to preserve them rather than waiting on the creation of new bacteria. And while vinegar pickling doesn’t create probiotics, it does keep most of the nutrients intact. It’s also more suitable for preserving foods without refrigeration — if you seal your pickles using the water bath canning process described in the recipe for Gingery Golden Beets below, you can store them at room temperature for up to a year. I like these two recipes because they show just how far beyond cucumbers your pickling experiments can take you. The grapes are sharp and a bit spicy; the beets mildly sweet with a ginger-plus-vinegar tang. Both pair deliciously with creamy cheeses. I like to toss them both with some arugula, goat cheese, and a little vinaigrette made from the brine for a pickled salad snack. Mason jars, pint or quart, with 2-piece lids I recommend using button-top lids. 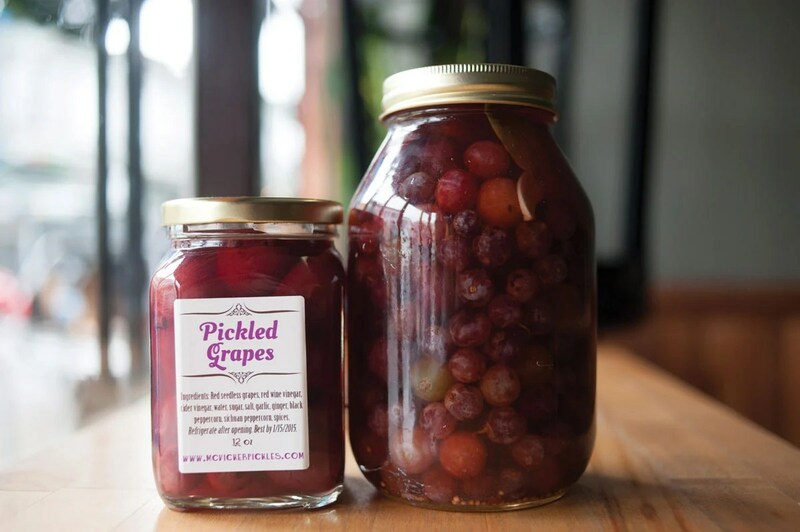 Grapes are perfect for pickling — firm and naturally acidic, with a soft skin that brine can permeate quickly. This recipe gives a deep, sweet flavor with surprising hints of savory from the garlic and bay leaf. Use Sichuan peppercorns if you can, for that special tongue tingle. Remove all stems from the grapes. Rinse, pat dry, and set aside. In a medium saucepan, combine vinegars, water, sugar, and salt and bring to a boil, stirring occasionally to dissolve. Reduce to a low simmer. Distribute the spices evenly between the jars, except for a few pieces of ginger and garlic, and the bay leaves. Fill jars with grapes, taking care not to crush them, and leaving at least 1" of space at the top. Add the last pieces of garlic, ginger, and bay leaves around the outside of the jars. Pour hot brine over the grapes, submerging them all. Put lids on jars, then let cool to room temperature before refrigerating. Let sit in the refrigerator 48 hours before tasting. These grapes will keep in the refrigerator for up to 2 months, their flavor intensifying with time. Golden beets are milder than red ones. Because beets are dense and naturally low in acid, you’ll take a few extra steps for pickling them. The water bath canning process creates a vacuum seal that makes the jars shelf-stable for a year. Bring a large pot of water to a boil. If you’ll be canning your pickles, also bring a canning pot or another large stockpot to boil. Remove beet tops, then scrub clean. Cook beets in boiling water until tender enough to pierce with a fork, about 10–15 minutes. Drain and cover with cold water to stop the cooking. Combine vinegar, water, and sugar in a medium saucepan and slowly bring to a boil. Peel and cut beets into medium-sized cubes or 1/2"-thick rounds. Pack the beets into clean pint-sized mason jars, leaving 1" of headspace. Pour the hot liquid over the beets, covering them completely but leaving 1/2" of headspace. Use a chopstick or other nonmetallic instrument to remove air bubbles, then add more brine if necessary to keep 1/2" of headspace. Using canning tongs or another heatproof utensil, put jars in a canner or a large stockpot with enough water to cover the tops by 1"–2". Boil 25 minutes. Sealed jars will keep at room temperature for one year. After opening, refrigerate and consume within a month. Kelly McVicker is the owner of McVicker Pickles, where she makes small batches using traditional recipes updated with new flavor combinations. 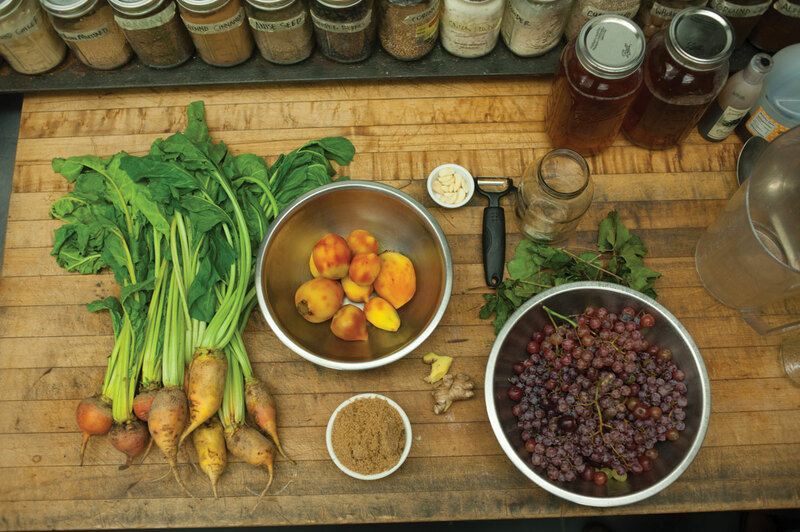 Based in San Francisco, she also teaches hands-on workshops on pickling, mustard making, cocktail shrubs, and other home-friendly skills.